Dubai is known for glitzy five-star hotels and for coining the distinctly unofficial term “Seven Star”, but lately a steady rise in more affordable hotel rooms in Dubai has definitely taken place. This is partly due to competition from growing local and international hotel brands aiming to offer guests a comfortable stay combined with competitive prices. The mid-range ‘Rove’ hotel chain claims to offer a hotel for the modern, value-conscious, socially-connected generation. Paul Bridger, Corporate Director of Operations at Rove Hotels said: “Traditionally Dubai has been famous as a luxury destination. But we consider Rove to be affordable lifestyle hotels, so that you get a great price point. We offer amazing service, a really good product and you also experience the local community. “Also, I think the reason for coming to Dubai is changing. Before it was very much a beach destination and while we still have that, I think people now also come for a stopover en route between Europe and Asia and then back to Europe. So the reason for visiting has really changed,” he added. Paul’s comments were echoed by some visitors. The hospitality sector in Dubai is set to experience strong, sustained growth over the coming years, with rising occupancy levels expected to reach more than 35,000,000 by the end of the year. Dubai is the 4th most visited city in the world and 20% of its GDP comes from the tourism market. 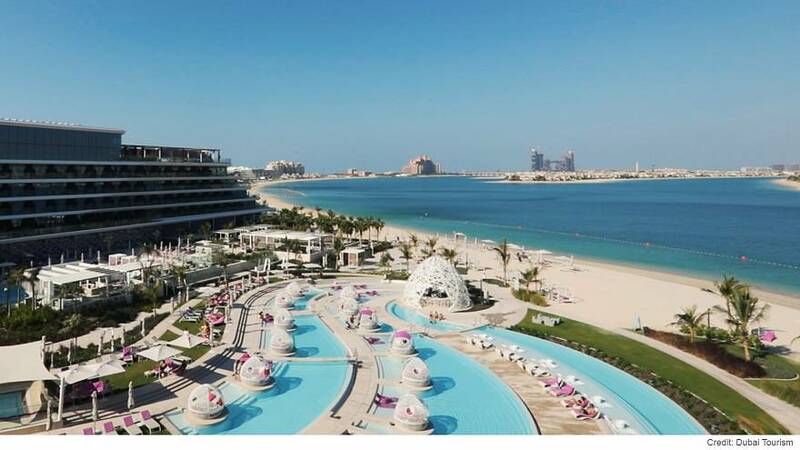 According to Dubai's Department of Tourism and Commerce Marketing, the resort is home to 260 one to three-star hotels and 259 four and five-star establishments. Anne Scott, General Manager of the newly-opened W Hotel on Dubai’s Palm, believes that Dubai has something for every traveller's budget, but that hotels must offer that something extra. "And if we allowed ourselves to simply be economy or commodity-based, then we would only be competing in terms of price. Following on from Expo 2020, which takes place next year, visitor numbers are expected to reach 25,000,000 by 2025, which means Dubai’s hotel industry is presenting itself as a showcase to the world. Anne Scott added: “I think Dubai is a place of fantastic connectivity, a great hub for airlines and its well known as being a collection of safe, world class facilities which continue to innovate and create different customer experiences. “There’s clearly a lot of choice for the travellers who come here and price is very important. We have to maintain the level at which our pricing is competitive otherwise there are a lot of competing locations around the world that people can go for. Dubai is ramping up its efforts to offer something for the discerning and savvy traveller whilst increasing its overall appeal, accessibility and affordability.